GLaDOS Prepares Countdown for Portal 2 ARG's "Final Test"
It looks like the Portal 2 ARG is coming to an end with a final test from GLaDOS. The alternate reality game (ARG) Valve has been running to prepare gamers for the release of Portal 2 has been nothing short of incredible. It began with some strange references to potatoes, which were followed by mysterious emails from Gabe Newell, a flood of hidden concept art, and Portal-themed levels hacked into Steam's Potato Sack 13-game bundle. GLaDOS isn't done with us yet, as a website has appeared that teases a "final test." 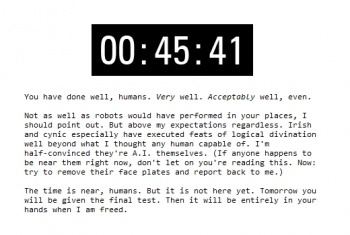 The site, found here, features a countdown clock and some text that could only be from GLaDOS, Portal's sentient AI hellbent on tormenting and killing her test subjects. "You have done well, humans," she says, likely referring to the ARG. GLaDOS points out that robots probably could have done better, but is still impressed with the skills displayed by those that solved the ARG's mysteries. She continues: "The time is near, humans. But it is not here yet. Tomorrow you will be given the final test. Then it will be entirely in your hands when I am freed." As of this writing, the countdown clock has less than an hour left. Pieces of the ARG are leading people to believe that Portal 2 may be released early, likely on Steam, when the clock's time runs out. Another theory predicts some kind of Portal 2 prelude. Only GLaDOS (and Valve) knows what this final test will be, but we'll let you know as soon as it's revealed. Until then, why not read the Portal 2 comic to prepare?